← What if our founders hadn’t been slave holders? Watching an educational film on the human body reminded me once more what makes for good instruction. While the practices displayed in the film apply to more than teaching American history, they underscore the them in a recent article in The Atlantic, High School History Doesn’t Have to be Boring. Each main idea was emphasized by a question posed by the narrator. Though rhetorical, the narrator didn’t immediately answer the question. The example that impressed me most concerned the skeletal system, the question having to do with why the thigh bone is constructed as it is. Several facts were presented. The thigh bone supports more weight than bones in the upper body. The thigh bone also absorbs the shock and compounded weight of walking and jumping, Finally, the ends of the thigh bone are porous. Next came the example that connected to prior knowledge. 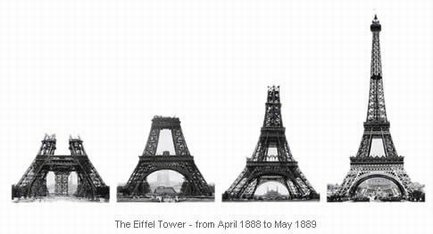 Unknown to me, Gustave Eiffel had studied the femur years before designing the famous landmark that bears his name. Taking note of how the body’s strongest bone had mass only where needed, thus the porous structure, Eiffel later designed the famous tower with its conspicuous design of thick, strong legs at the base with diminishing amounts of material seen as the structure supports less and less weight as it rises above Paris. 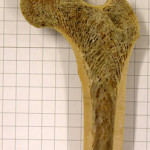 Where support is not needed, there is no material – just like a human femur. By high school, most if not all students have at least seen a picture of the Eiffel Tower. For the film’s purpose, it was not necessary that students knew many facts at all about the landmark structure, let alone its history, for the connection to be made. This particular example wasn’t an analogy, though it could have been. How do you know learning has occurred? I’d long ago learned never to show a film for much more than ten to fifteen minutes without stopping to check for learning. By this I mean I’ve learned to engage in formative assessment, usually by means of a few probing, open-ended questions, those requiring more than a simple response from the student. When I stopped the film, which of course was a CD, I was pleased with the student responses. 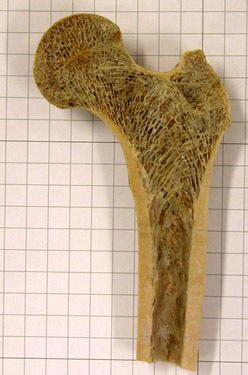 Like me, students were unaware of the connection between the femur and the design of the Eiffel Tower. My open-ended questions soon sparked a small, but thoughtful class discussion on the key points of why bones that carry more weight are designed differently than those supporting less and how the body’s process of growing new bone at points of stress while removing bone mass in compensating areas of little stress causes many bones to be completely regenerated every decade The students applied their prior prior knowledge of what might at first have seemed an unrelated item and expanded their learning far beyond the basic facts presented. In David Cutler’s article, two statements, one by Cutler, another quoted from yet another author on the subject of teaching well, stand in contrast to standing practices of many. The first of these is particularly apt for a blog entitled History as Prologue. That quote implies the teacher routinely involves students in current events, which Cutler confirms he does each Wednesday. Using such a strategy in conjunction with the practices illustrated by the Human Body CD, teachers can dramatically, I argue, improve student achievement. But redefining or perhaps clarifying what it is you want the student in an American history course to actually achieve is the point of the second quote. Quoted from Bruce Lesh, like Cutler, also a history teacher, in his book “Why Won’t You Just Tell Us the Answer?”: Teaching Historical Thinking in Grades 7-12, an innovative reasoning of why we teach history is presented. Though this shouldn’t be seen as revolutionary to social studies teachers, there are those so lashed down by false nostalgia that teaching students to make good arguments is seen, quite irrationally in my opinion, that higher order skills implies, in their minds, that facts don’t matter. That, of course, isn’t the case. Like so many terms in teacher talk, formative assessment or evaluation is ubiquitous. It’s meaning, to diagnose student learning in order to adjust instructional activities for the student to maximize achievement, has become the sad practice of conducting pre and post-unit assessments with little to no differentiation driven by assessment. Once again, the further away from the individual student instruction is planned, the exponentially less is the achievement. Assessing and then providing scaffolding for student skills is indispensable. For more on this, see Teaching American History Badly. Knowing what the student knows, likes and piques his or her curiosity remains, in my opinion, key to maximizing achievement. As I’ve stated previously, learning as early as possible from the true expert on the student – the parent or guardian – what strengths and weaknesses students have before a unit of study is constructed is the most promising means of teaching American history well.